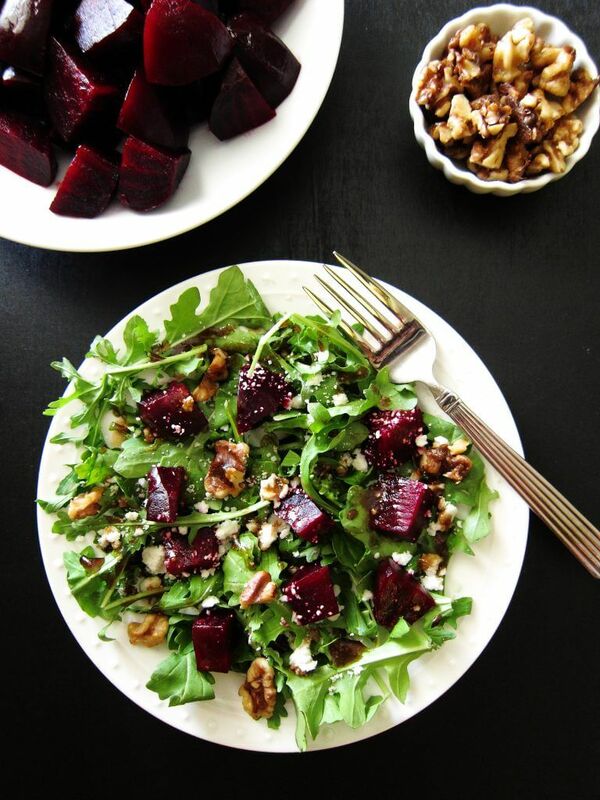 This beautiful and tasty Arugula Salad with Instant Pot beets, goat cheese and candied walnuts has a delightful balsamic vinaigrette dressing and is perfect as a side salad or as a standalone lunch salad. It seems as though every restaurant I go to these days has some kind of beet salad. Beets have become really popular in recent years; you can find beets in everything from hummus and salads to drinks and even cakes. I love beets and their distinct, earthy flavor but I don’t cook them very often because my kids don’t really care for them. So I order beet salads every chance I get when I go out to eat. 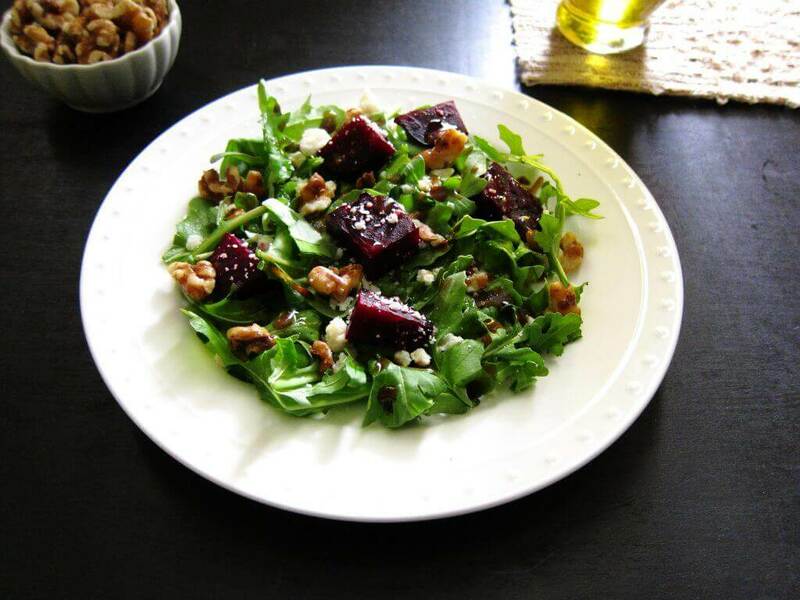 The combination of ingredients in this salad with Instant Pot beets is a common one on restaurant menus – arugula, goat cheese, beets, walnuts, and balsamic salad dressing – that are simple and taste perfect together. One reason people avoid cooking beets is that they can take a long time to cook. There are different ways to cook beets: you can roast beets in the oven, boil beets in water on a stove-top or you can steam beets. 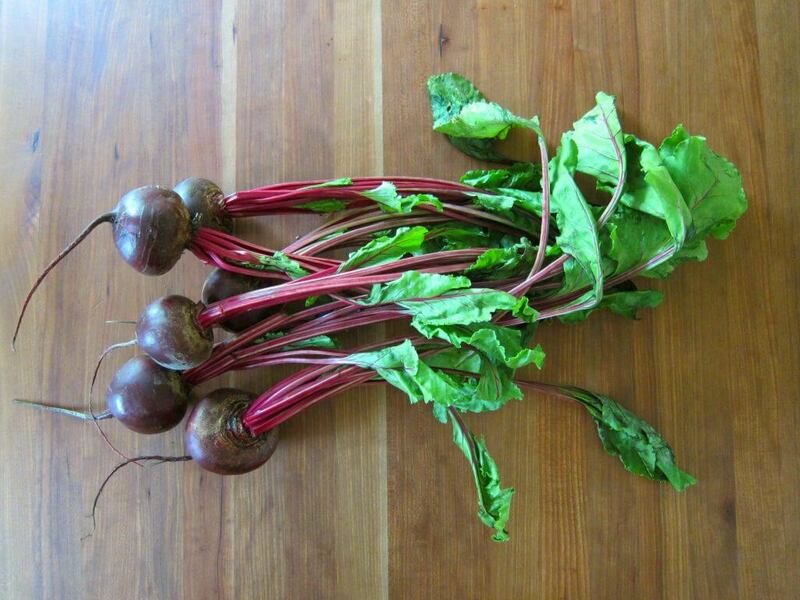 The best and quickest and easiest way to cook beets is to steam beets in the Instant Pot pressure cooker. 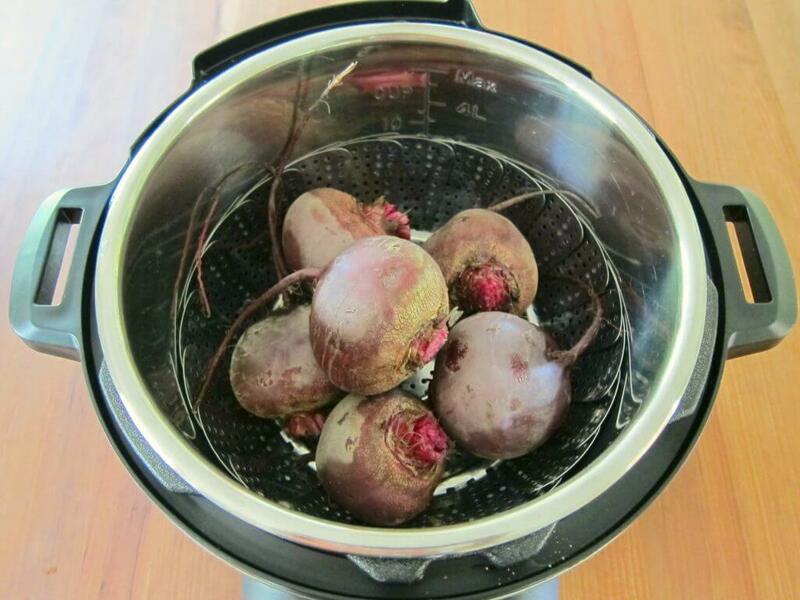 Instant Pot beets cook in 20 minutes including time to come to pressure. Beets or beetroots are loaded with healthy vitamins and minerals, and are full of fiber – in other words, beets are good for you! Having this brightly colored superfood in your diet can really pack quite a nutritious punch. This Arugula salad with Instant Pot beets, goat cheese and walnuts can be served as a side salad to a main course like Instant Pot Coq au Vin or Instant Pot Shrimp and Grits. Don’t throw away the beet greens and stems. They can be cooked the same way you would cook Swiss chard or other greens: put them in a soup or saute them in olive oil. If you don’t use all the Instant Pot beets, you can store the pressure cooked beets in the fridge for a couple of days. 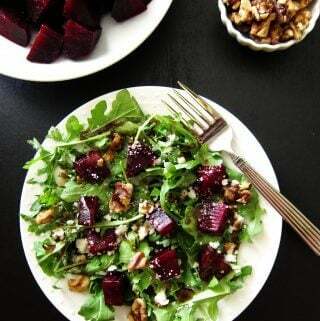 To make the salad really stand out, try to use different varieties of beets such as yellow and orange colored beets! 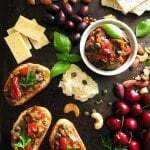 I sometimes use pecans instead of walnuts and feta cheese instead of goat cheese. If you’re new to the Instant Pot and aren’t familiar with how to use it, please read the Instant Pot DUO Beginner’s Quick Start Guide or the Instant Pot ULTRA Beginner’s Quick Start Guide first and then come back here to learn how to make Instant Pot Beet Salad. 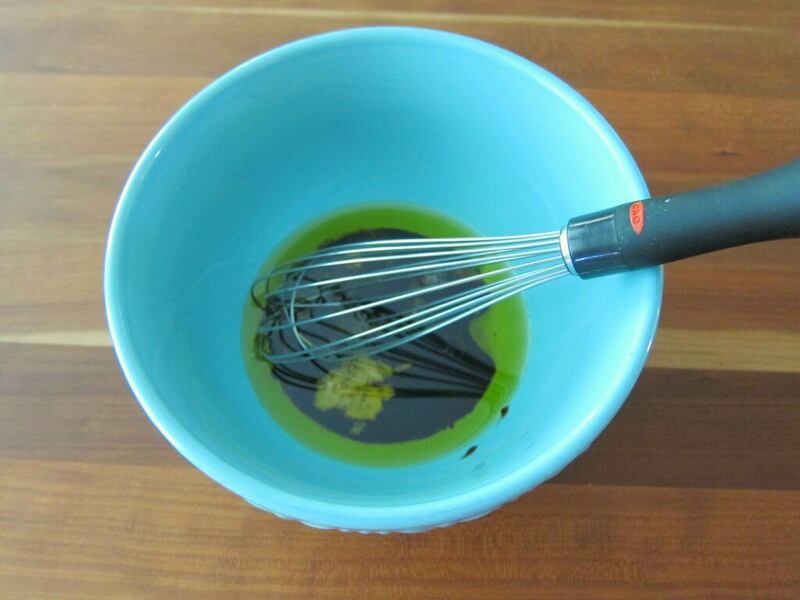 Combine balsamic vinegar, extra virgin olive oil, Dijon mustard, garlic, salt, black pepper and sugar using a whisk; set aside. Combine butter or ghee, walnuts and brown sugar in a small frying pan. 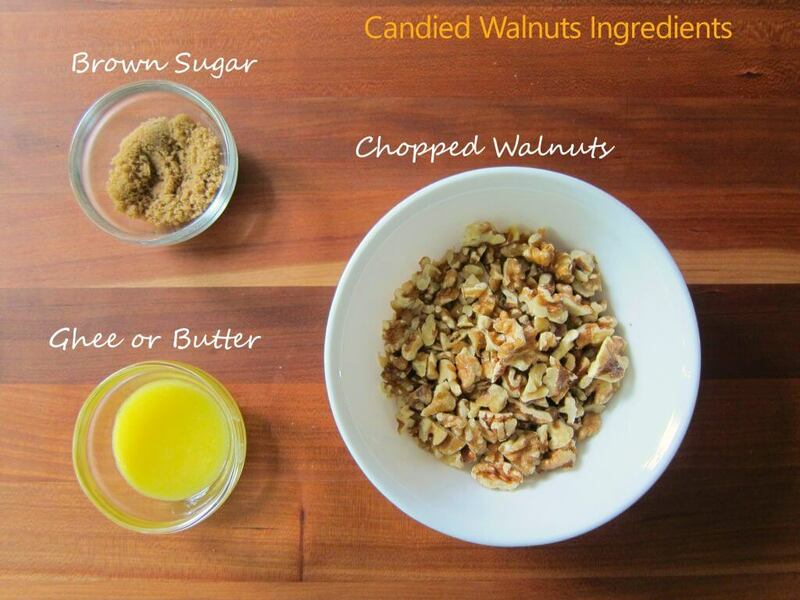 Saute until sugar has melted and walnuts are toasted. Cool on a silicone mat or parchment paper. Fill inner pot with 1 cup water. Place steamer basket in the inner pot. Place beets in the steamer basket. The display will count down from 15 to 0; it will switch to ‘Keep Warm’ mode and display ‘L0:00’. When cool enough to handle, remove steamer basket from inner pot. Cool Instant Pot beets completely. Cut off both ends of each beet. Peel with a vegetable peeler or remove skin with your hands. Cube Instant Pot beets into 1/2 inch pieces. This beautiful and tasty Arugula Salad with Instant Pot beets, toasted candied walnuts, goat cheese and arugula has a delightful balsamic vinaigrette dressing and is perfect as a side salad or as a standalone lunch salad. 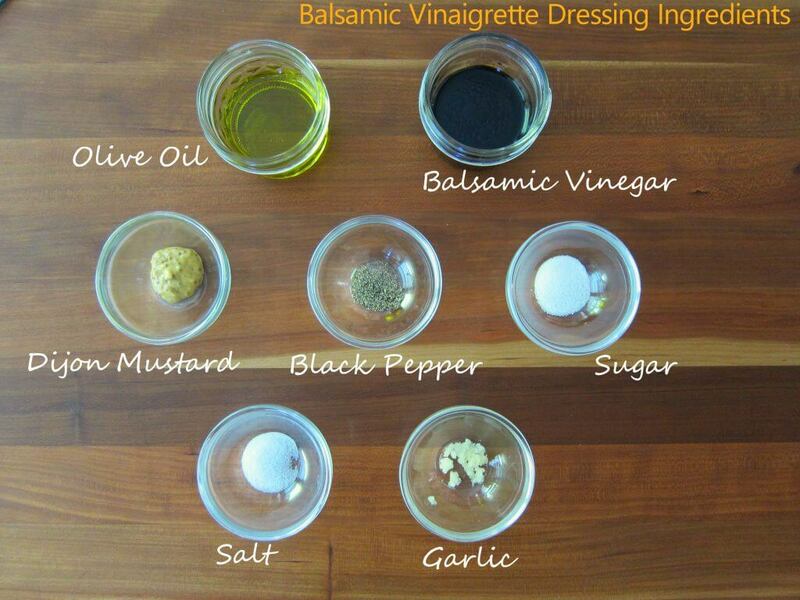 Combine balsamic vinegar, extra virgin olive oil, Dijon mustard, garlic, salt, black pepper and sugar in a small bowl. Stir with a whisk and set aside. Cool on a silicone mat or parchment paper and set aside. Place beets in a steamer basket in the inner pot. Cook on 'Manual' (or 'Pressure Cook') mode for 15 minutes. Peel beets with a vegetable peeler or remove skin by hand. Cube beets into 1/2 inch pieces. Start with a layer of arugula. Sprinkle goat cheese and candied walnuts. Drizzle with balsamic vinaigrette salad dressing. 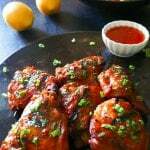 See the blog post for detailed recipe tips. Bruce, I agree! It’s a very refreshing salad. Thanks for taking the time to comment. I made this salad to take to a family event. The whole salad was great: the pepperiness of the arugula contrasts well with the candied walnuts, along with the acidity of the balsamic dressing and the tartness of the goat cheese. But I wanted to comment of the beets. They were amazing! So many people asked how I made them because their consistency was perfect. 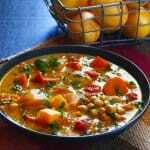 I never would have thought about using the Instant Pot to cook them had I not found this recipe. Thank you, thank you, thank you!! Wow, amazing flavors! And it was really easy to make, thanks to your awesome instructions and beautiful photos! thanks for sharing! Fantastic salad, have made 4 times already! Thanks for the comment, Lesley – I’m so happy you liked it! Is it possible to cook and cut the beets the night before and assemble the salad the next day? Eric – I do this sometimes. So, yes. Thanks for your question. Excellent salad‼️ The flavor combination is very well balanced. This is a keeper. Thank you. Thanks, Launa – so glad you enjoyed the recipe. I’ve on beets kick lately and put them in everything!